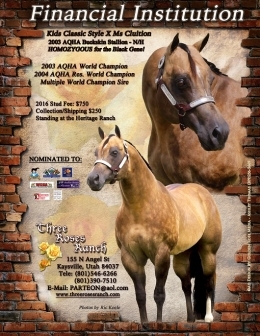 2003 AQHA World Champion, 2004 AQHA Reserve World Champion. Sire of Multiple World Champions on Multiple Associations. Nominated to NWSSA-Best in the West Futurity-AQHA Incentive Fund, APHA Breeders Trust, WCHA and the Sierra Paint Horse Club futurities.